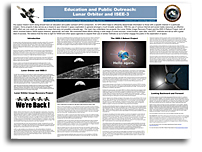 Any space mission worth doing should have an education and public outreach (EPO) component. An EPO effort helps to efficiently disseminate information to those with a specific interest in a particular mission. Done properly it also serves as a means to spur interest in space exploration in general amongst a much broader audience. With the use of various Internet and social media resources an effective EPO effort can now reach an audience in ways that were not possible a decade ago. In Part 3 of The Invisible Photograph, see how the “techno archaeologists” of the Lunar Orbiter Image Recovery Project digitally recovered the first photographs of the moon taken by a set of unmanned space probes in the 1960s. More information and Gigapan imagery. The lunar orbiter project is made up of “a group of dedicated space industry professionals who have worked for several years to digitally recover the first photographs of the moon and the first photographs of Earth taken from the moon,” Ms. Heffley said. Their work site is an abandoned McDonald’s on a NASA naval air station in Mountain View, Calif. When the Carnegie Museum film crew arrived in March, the team of techno-archaeologists had just digitized the final of the more than 1,400 magnetic tapes. Join us for the world premiere of Extraterrestrial, Part 3 of The Invisible Photograph. Begin the evening with a look into the Lunar Orbiter Image Recovery Project. See how a team of techno-archaeologists digitally recovered the first photographs of the moon, taken by unmanned space probes and used to determine the landing sites for the Apollo missions of the 1960s and the 1970s. Then join us in the Sculpture Court for a screening of finalists from this year’s 2-Minute Film Festival, showcasing films that explore the concept of outer space–in two minutes or less. Picnic food and bar open in the Sculpture Court beginning at 7:30 p.m. The Invisible Photograph, a production of the Hillman Photography Initiative, is a five-part documentary series investigating the expansive realm of photographic production, distribution, and consumption by way of the hidden side of photography. 8:15-9 p.m.- Screening of Extraterrestrial with Keith Cowing, co-lead of the Lunar Orbiter Image Recovery Project and Divya Rao Heffley, Program Manager of the Hillman Photography Initiative. 9:15-11 p.m.- 2-Minute Film Festival, back for the 4th time! $10; includes one drink ticket!